Cars are so much fun to make...especially the ones that can move on their own. The trick to making your own toy cars is figuring out the way that wheels turn and move. If you don't know the mechanics of how wheels move, than you won't be able to make your own cars. Don't worry, you don't have to be an engineer to know how vehicle's wheels move and turn. There are two ways to make wheels turn. One way is the make the wheels spin and the other way is to make the axle spin. Neither way is the right way or the wrong way...both work just fine. 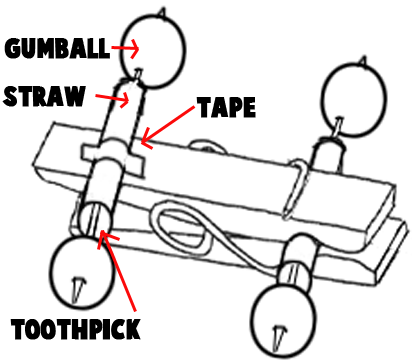 To make a car / vehicle with a spinning axle : Slip the axle (such as a toothpick) through a larger tube / cylinder (such as a straw). Now make wheels out of something (such as bottle caps, buttons, cork, etc). and stick these to the end of the axle (toothpick, chopstick, pencil, etc). These wheels must be tightly secured to the axle...so the axle turns inside the tube, but the wheels don't. To make a car / vehicle with spinning wheels : Okay, so if you want the wheels to spin, then you will need to place the axle (toothpick, etc) inside a bigger hole in the middle of each wheel (or a tube / cylinder (straw) that is placed in the middle of each wheel). An example of this would be to cut a hole in a bottle cap...one large enough to stick a small straw inside of it. Then place the toothpick in between both wheels...now the wheels will turn on the toothpick (axle) instead of the axle turning with the wheels as one piece. For the body of the car : Some items that would be great for the body of the car are clothespins, boxes, empty soda bottles, milk cartons, empty match boxes, plastic hair rollers, film cannisters, disposable cups, lettuce containers, spice containers. For the axles: toothpicks, chopsticks, skewers, old markers, pencils, tinker toy sticks, lego rods, plastic drinking straws, dowels, branches that are straight, etc. For the wheels: Some items that would be good for the wheels are candy gum balls, carrot slices, plastic caps, life savers candy, buttons, some beads, thread spools, vcr spools (take apart a vcr tape that isn't used any more), metal washers, CDs or DVDs, cardboard tubes (cut into smaller pieces). Now just use your creativity...engineer a cool, working toy car. Look below for the available crafts ideas. Here is your chance to make a car that moves on its own - and it isn't too difficult to make either. Ask your parents to recycle an empty milk carton. Clean out the milk carton and dry thoroughly. Cut the milk carton (as seen in picture #1 above) so that you have most of one side and a little bit of the bottom of the carton ... it should look like picture #2 above. Poke a hole in the bottom portion of the carton (picture 2). This is where the balloon will be pushed through. Tape straws on the long side of the carton. Get 4 milk jug caps and poke a small hole in each one. Push a chopstick into one of the caps and then put the chopstick thru one of the straws. Then push a cap on the other side of the chopstick. Do the same thing for the other set of wheels. The cap should be tight on the chopstick so that it doesn't spin at all. 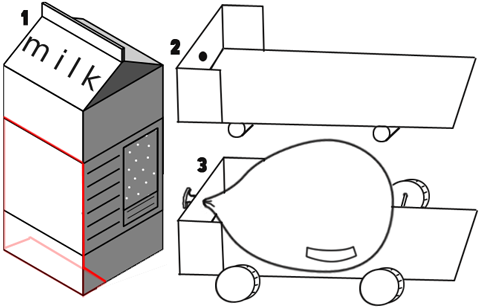 Now push a balloon thru the hole in the carton...and blow it up with air (as seen in picture #3 above). let it go and the car should zoom away. Have fun. Rubber Band Motorized Dump Truck Toy - Make a dump truck that really goes...with a plastic container, some caps, and rubber bands. Make a Milk Carton Trailer - Do you want a mobile home trailer for your toy cars? Here is how...just get out a milk carton and some string first. Pretend Play with Cars - Use a large cardboard box to pretend your driving a car.